If you want the short review, this is a Transformers game with some flaws, but it IS a Transformers game as opposed to an action game that any license could be shoehorned into and is worth at least checking out by Transformers fans. Sorry, that�s about as brief as I get. I liked the game overall, even with some strange design choices, and I would recommend it to Transformers fans who have the systems on which it is available. The game more closely based on the movie is available for the Xbox 360, PS3, Wii, and PS2 systems. There are variations in price, graphics, and some controls (Wii and PS3 have motion controls), so bear in mind that it was the Xbox 360 version I reviewed when reading about graphics and controls. Maybe I shouldn�t start off with one of the weaker points, but gameplay is, in my opinion, the main quality that needs to be assessed in a game. Transformers� gameplay is disappointingly mediocre for the most part, and has some design choices that are downright confusing. For example, the characters have awesome ranged attacks that are beautifully animated and detailed, but you almost never use them because almost every enemy blocks them! Why does Ironhide have some of the coolest ranged attacks I�ve seen in an action game recently, but even the weakest Decepticon drone can block them? The only incentive to use the ranged attacks is during one of the incessantly boring boss �battles.� I use quotations because they�re not so much battles as they are puzzles that hurt you until you figure them out. The combat has very little skill involved, which could be understandable since younger players are part of the demographic, but it�s so painfully repetitive that I started avoiding combat until I had so many enemies on my back that I had to deal with them to continue. The transformations feel fun though, and I actually got a lot of enjoyment out of running around and transforming. Traveller�s Tales also did a good job in creating a destructible environment. Almost everything in the environment can take damage and many things can be picked up and used as weapons. However, good luck picking most things up on the first button press. I sound really negative towards the gameplay, and I am, but despite the poor points I�ve gone over above, it�s otherwise a competent action game. I just wish I knew how the combat came about. Did they run out of time, or did someone actually think the system worked? I don�t have much to say about the controls other than I wish they were configurable by the player, but I never felt like they were exceptionally bad or good. I just wanted to switch the block and lock-on buttons. During gameplay, you just can�t argue with the graphics. They look great, the animations are stellar, and the attacks have some really cool effects (check out Optimus Prime�s melee). In fact, I would say that the graphics is the one area where the game goes above average, and it goes far above average. There are some minor clipping issues (when you can see part of one 3d object going through another), but given the ambitious everything-can-be-destroyed nature of the gameworld, I�m more than willing to give them a pass on that. The audio sounds great with a 5.1 setup, and for all the faults the combat has, the sound effects more than deliver satisfaction. You know how action games have to have just the right sound when hits are delivered? 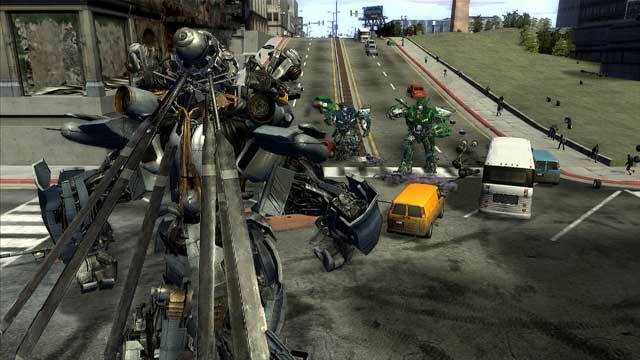 Transformers: The Game found all the right sounds for robot on robot violence. The one complaint I have in this section is the incredibly lame cutscenes. The animation is laughably bad both in quality of picture and the actual animation of the 3d models. Why not use cutscenes from the movie? Why not use the in-game engine for storytelling? That would have been much better-looking. I know you�re not buying a movie game for the plot, but the cutscenes totally underdelivered compared to the in-game graphics. 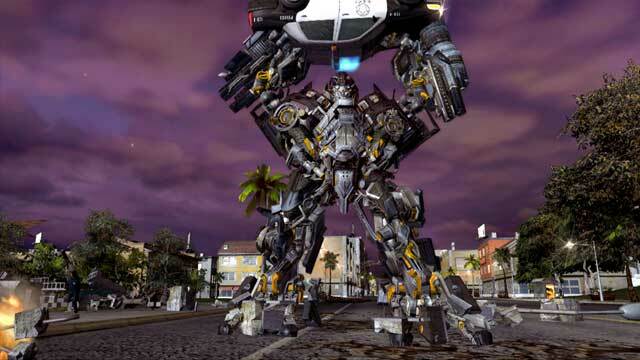 The game is reasonably enjoyable if you�re a Transformers fan. If you�re a Transformers fan who is also a regular gamer, then expect an average game that has some characters you like. It�s worth a rental to check it out either way, but a purchase might want to wait until a price reduction.